Not long ago I was talking to a dentist who felt that his website design had little to do with its effectiveness in converting visitors into patients. I guess it shouldn’t be surprising that some dentists feel that way. Even some business professionals are steeped in a logical approach to marketing. Roger Dooley, the author of the popular “Brainy Marketing” blog at Forbes.com, reports, “I still encounter business executives who don’t believe they are swayed by emotional factors when buying things, and often doubt that others are either.” But, as he goes on to explain, the hard data says otherwise. There is a trade organization in the United Kingdom called the Institute of Practitioners in Advertising (IPA). Their membership includes the best and brightest of marketing agencies in the UK, from a broad range of disciplines, who between them handle an estimated 85 per cent of all UK advertising spend. Since 1980 they have been accumulating a database of marketing campaigns and have analyzed which marketing approaches have been the most effective. 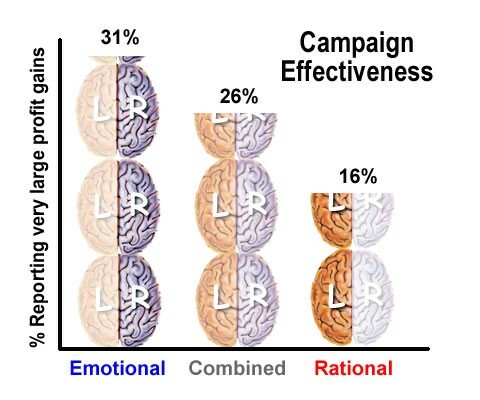 A couple of years ago, in a bottom-line analysis of the results of 1400 case studies, they found that marketing campaigns with purely emotional appeals were nearly twice as effective as campaigns with purely rational appeals. Emotional appeals resulted in very large profit gains 31% of the time. Purely rational appeals were similarly successful only 16% of the time. Combined approaches succeeded 26% of the time. This can be a tough concept for some of us dentists. We tend to be left-brained people, scientific and logical in our approach to almost everything. But think about this concept the next time you are watching any television commercials. Companies invest millions of dollars in both the production and airing of these commercials, and the successful ones have a strong emotional component. These successful companies discovered long ago that they can’t rely on logic alone to sell their products. My wife and I were recently watching an old Jack Benny show from 1952 on YouTube. Lucky Strike Cigarettes was the sponsor, and the first commercial of the show featured two men taking apart a Lucky Strike cigarette as one of them explained how carefully the cigarette was packed and discussed the high quality of the tobacco inside. It was clearly a very logical approach to selling cigarettes. But Lucky Strike must have abandoned that approach rather quickly because, in spite of watching a number of old television shows and seeing a number of Lucky Strike commercials, I had never seen that one or any other cigarette commercial remotely like it. Do you know which cigarette commercials had the greatest impact? First place in the annals of marketing success goes to the Marlboro commercials featuring the Marlboro man, a totally emotional appeal. When the Marlboro man was rolled out nationally in 1955, Marlboro sales jumped from $150 million the previous year to $5 billion. By 1972, the Marlboro man made Marlboro the leading tobacco brand in the world. And in second place would probably be the Camel commercials featuring Joe Camel—a figure so emotionally powerful that his presence in commercials was banned thanks to government pressure in the late 90s. Look at the Coca Cola commercials. There is no logic in them at all, and yet they have made Coca Cola the most valuable brand in the world. So does website design affect the conversion of website visitors into patients? Absolutely! We have confirmed this over and over again as we have led client after client through website redesigns. This is what establishes the critical first impression of your practice. Time after time we have seen a website redesign increase phone calls to a practice by anywhere from 40% to doubling. And it is fairly predictable that a new design that conveys a classier image to the practice will increase the quality of new patients—more patients seeking quality care, looking for complex dentistry, or wanting smile makeovers.